Looking for a Baking Recipe for Baby? I love a good baking recipe, as you simply mix together the required ingredients, stick it in the oven, and voila – as if by magic, you have a perfectly (most of the time!) turned-out cake. And which child doesn’t love home-baked goodies as a treat from time to time? Remember to avoid offering baby refined sugars in his first year, if you don’t want him to develop a sweet tooth later in life. For babies under a year, cakes can be sweetened with ripe fruit or fruit juice. Older babies and toddlers can be offered cakes as an occasional treat, lest they come to expect them regularly! This is a traditional treat to eat when celebrating Chinese New Year. This was J's official 3rd birthday cake - great for those who love both banana and chocolate! 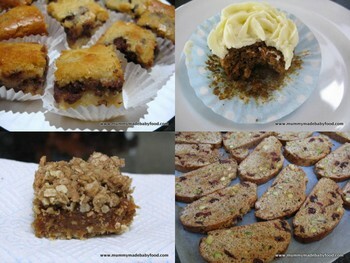 I baked these for J's 3rd birthday - both sweet and healthy, they are a great treat for little ones. A favourite in the autumn months, when fresh cranberries are in season - little ones love the crunchy texture of the crumble topping. Also flourless and dairy-free, this indulgent cake is delicious whilst also catering for those with dietary restrictions. A real crowd-pleaser, these bite-sized goodies will keep little (and big!) ones coming back for more. A fun crisp texture for little teeth, these make ideal gifts, or keep them for dunking into your own cuppa. Spice up autumn with these not-so-spooky Halloween treats! Ideal for younger babies, as these are sweetened only by ripe bananas. Packed with energy for on-the-go toddlers, these are a healthy alternative to commercially prepared granola bars. Ideal for breakfast, my son loves the crunchy texture, and I love that it is healthier than store-bought granola.